—Reverend Dr. Martin Luther King, Jr.
Saturday, when pulling into my friend’s icy driveway, I saw a large cardboard sign propped in her car’s windshield with the neatly handwritten words, CHALLENGE RACISM. We were headed to the movies to watch The Imitation Game. It wouldn’t have been my choice of movies, but I wanted to spend the evening with Lauren who I hadn’t seen in far too long, so the choice of movie was of little import. The film was just as I expected: a mediocre period piece based on the true story of a white man—albeit a gay one—written and directed by white men and with a predominantly white male cast. I watched the predictable story unfold, deeply aware that the movie Selma, about the Civil Rights Movement and which I’d preferred to have seen, had, for all intents and purposes, been snubbed by the Academy of Motion Pictures members—no great surprise considering the Academy is 92% white, mostly male, and the average age of its members is 62. Could it be worse than our present congress? I fear, yes. On the drive home we talked about the sign in Lauren's windshield. She told me that every Friday evening she stands with a group of peace activists at the corner of Pleasant and Maine Streets brandishing various signs like the one in her window and others such as BLACK LIVES MATTER. Lauren, who is white, went on to say that often she gets honks and thumbs up from drivers, but that once she was flipped off and sometimes she is heckled. I told her that she should write the word RACIST on the backside of her signs so that she can flip them around in response to the haters' vitriol. But she said she’s usually too shocked to react and even then her impulse is to diffuse the situation peacefully. She's a better person than I. Nearly forty-seven years ago Rev. 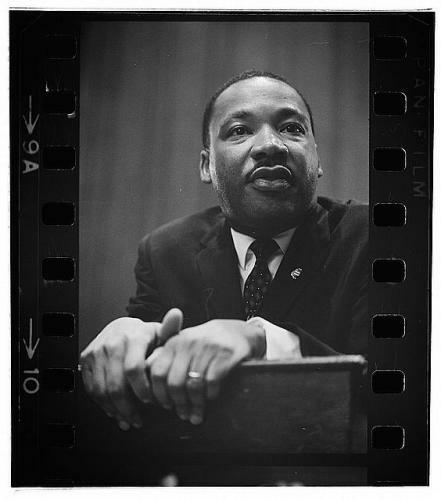 Dr. Martin Luther King, Jr. was assassinated in Memphis at the age of thirty-nine. He was a champion of the African American Civil Rights Movement and the Peace movement and his aim was to achieve equality for his people who had been enslaved in this country for centuries and who continued to be literally and figuratively stomped on, pushed aside, held down, beaten up, burned out, fire hosed, strung up and thrown in jail by white people, most of them men. Now, in 2015, many things have shamefully gone unchanged. The racial caste system, which originated with slavery, evolved into segregationist Jim Crow law before morphing into the racist lies and ills of the War on Drugs, still exists. Black boys and girls are targeted, punished, suspended and expelled from school at alarming and disproportionate rates compared with whites, even as early as preschool. Black schoolboys and schoolgirls, who are seen as miscreants, are harshly punished, often ending up in juvenile detention centers while their white counterparts get slapped on the wrist. Black boys and men are wrongly stopped and frisked, pulled over, harassed, often falsely accused of petty crimes and/or resisting arrest. They are tasered, gunned down or choked to death by aggressive, racist white cops. The ones who survive are convicted, often falsely, incarcerated and sent to prison to serve ridiculous sentences including—again, at alarming rates—execution. Those who are released are legally discriminated against for the rest of their lives at almost every level of society: housing, education, health care, employment—even one of the only avenues they can take to change the very system that oppresses them: denial of the right to vote. Some, like the author of one of the books I’m reading with the selfsame title, call this systematic oppression The New Jim Crow. Today, Martin Luther King Day, I think about the ongoing subjugation of black people. And, because of who I am, who I love and who I have become, I also think about the legions of others—disabled people, women, Muslims, gay people, transgender people, immigrants, Hispanics, poor people, Native Americans, homeless people, disabled people—who continue to be marginalized by a society governed predominantly by oligarchs and their greed, selfishness, intolerance, conceit, apathy, contempt, ignorance, self-righteousness, desire to exploit others and their lust for power. Then, I think about how much better we can do as a nation, as a people, to incite change. If only each and every one of us—millions—could rise above our individual concerns to see the plight of others, then go one step further and courageously, like Martin Luther King, Jr. and Lauren, choose to do something about it, if only through our words. Again, thank you for your words Christy. Yesterday I walked the MLK march in my town. In 2004 when I was leading lonely peace vigils in my town, I was asked to speak at the MLK event. No words of my own could match those of Rev King's Riverside speech about the Vietnam War, so I just bowed to him and felt overwhelmingly honored to be a conduit to repeat his Riverside words that day with a new war right on our horizon. There were many whites in the crowd that year, including the Mayor of my southern white town. This year there were only 4 whites in a crowd of 150+ folks, but the day was sunny and bright and I was welcomed as always. We marched and we sang and we replenished each other this way. Afterwards I went to see "Selma" by myself. By chance a friend walked into the darkened theatre and saw me and sat with me. She had brought a friend who had actually been in Selma marching in 1965! After that incredibly great movie (GO SEE IT!) I got to hear about her experience. This bright-eyed, aging white woman said that what struck her more than anything about being in that place at that time, was that all these people, from all different religions, backgrounds, races, ages, etc. came together, cooperated, took care of each other, and worked pretty seamlessly as a community even though they really didn't know each other at all. People can actually be pretty amazing when they put their minds to it. thank you, sue. how did you come to read my blog? i am glad that you are. Christy - I really don't remember how I ended up reading your blog. i don't read very many on a regular basis....but whichever rabbit hole it was...i am glad to be here with you, too... comforting somehow.